“This week I’ve been watching the ongoing result of a process of believing in youth and adults with Down syndrome. It happens on a stage. With music and movement, line memorization, skill and talent, beautiful costumes and laudable characters. For the past six months, professional acting troupe EDGE of Orion has been working with UPS for Downs, a local nonprofit here in the northwest suburbs of Chicago, and with about 40 people with and without disabilities to bring The Music Man to the stage in Norridge, Illinois, just east of O’Hare Airport. They’ve been doing this for about 10 years now and every season brings a new performance. 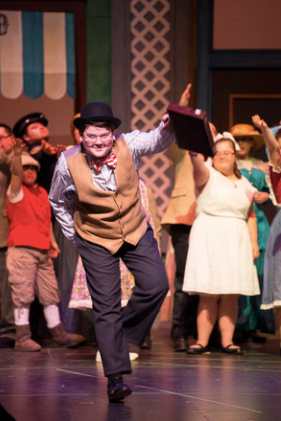 Without formal special education degrees or certificates or training, leader Orion Couling and his team work with actors in crafting their art. He is tough. He is engaging. He and his team demands the highest level of attention and performance from the actors. They provide support for actors that need it on a continuum of levels that is almost invisible to the audience. He isn’t easy on them and if you get out of line prepare to be reprimanded with suggestions for how to improve. He treats this group the same way that my theatre directors from former years treated me – tough, fair, delighted with progress in theatrical expression. As a person worthy of being on the stage. And what is perhaps not so amazing, this group of people, many of whom do have intellectual disabilities, respond to his leadership with the precision of a well-trained army with a single focus: to perform. They are on time. They warm up with vocal and physical exercises. They wait their turn, they risk, they learn, they respond. They memorize lines and music and staging. I’ve seen shy youth change over time into expressive giants on the stage under the EDGE of Orion team’s support and encouragement. To watch this over time, it is clear that these actors are working at a high level of complexity, understanding, interpreting, and expressing their own art in relationship with each other and with their non-disabled peers in ways that transcends my own expectations, and perhaps those of others. Yes, the singing may be off key at times. Yes, there may be cues missed occasionally or lines dropped. Yes, some of the actors’ speech realities require imagination in translation. The audience’s role is not to forgive these patinas but to enter into an unique space in which language and perfection become secondary to the intent of performance. In so doing, the performance become perfect as it is. At the core of all of this is that these actors have the opportunity to participate in one of human society’s oldest craft – theatre – and tell a story through their own expression. And in this experience, they become other and the other is without disability, without “being special,” and it is with high expectations for exceptional performance. 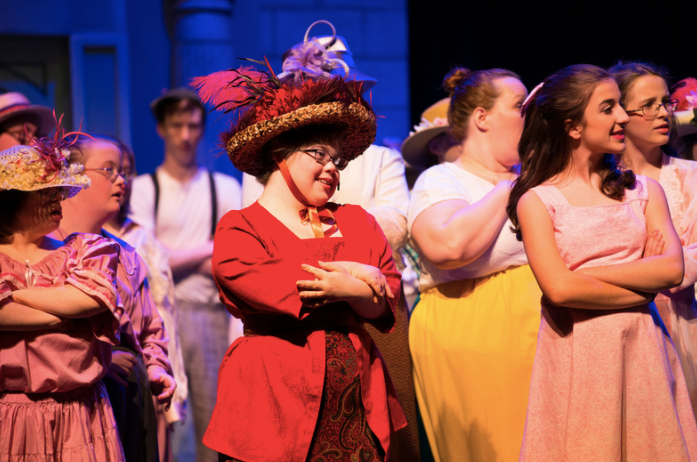 Watching children from all different backgrounds– all different struggles of life- coming together to put on an absolutely PHENOMENAL performance in Annie Jr., I could not help but be TRULY INSPIRED…. When we are born into this world, we KNOW NO STEREOTYPES…we know no colors, races; we know no labels!!!! Although ALL OF OUR STRUGGLES, ALL OF OUR CHALLENGES are different…WE ALL STRUGGLE. WE ALL HAVE CHALLENGES. So the question is….What can we, as parents, do to instill this in our children? To remind our children that although we are all different…we have DIFFERENT strengths and different struggles…WE ARE ALL still THE SAME. We ALL have feelings. We ALL have our OWN INDIVIDUAL strengths, our OWN INDIVIDUAL challenges. Let us not point fingers ? ?, stare ?and create barriers between one another but rather EMBRACE our differences…WORK TOGETHER ?to maximize the power of our own individual strengths ? ?and watch as the struggles and “challenges” fall to the wayside when we work together as ONE?️…!!!!!! This is our first year participating in Orion Couling’s program. My 14 year old daughter and I attended Orion’s production of Guys and Dolls last year. It was so fabulous to see the young adults shine so authentically and so powerfully. The show was fun and brilliantly choreographed. I was impressed by the independence and confidence shown in each performer, as compared with a dulled expression some times seen in programs where “buddies” are used on stage. The buddy/mentor system certainly has it’s place and we’ve been a fortunate recipients of that experience. Perhaps that experience prepared Naomi (my daughter) for the “raised bar” that Orion offers. I must say, Naomi’s esteem is developing! And this is with thanks to Orion’s greater expectation- which is put forth with firm kindness and inspired example. The best part of participating in Orion Couling’s program is that he is authentic. His inspiration is true and strong. The kids and parents can feel this – naturally, he creates response. Obviously, Orion is an artistic professional. He shared his vision with the families from the start of this year- and we have all been participating in a journey toward a show that promises to enlighten our world. Who doesn’t want to be part of an effort to make a difference in the world? Orion’s staff is great. The organization is exceptional. There is great communication. Naomi looks forward to attending class/rehearsal and takes her study seriously. 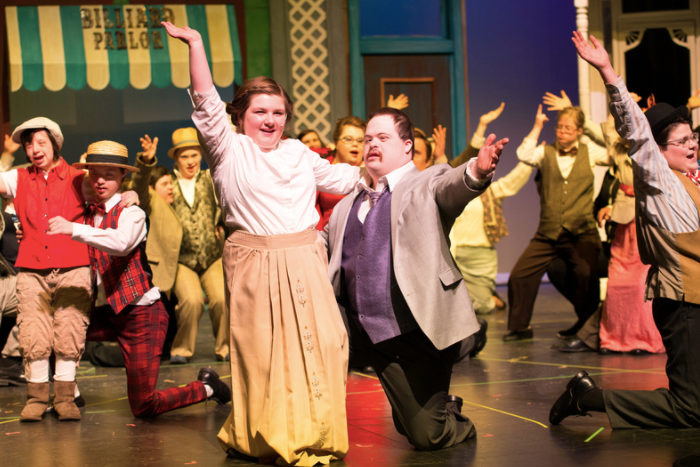 She has had an opportunity to work alongside a whole community of young adults with Down syndrome for the first time. I believe this in itself has had an enormous impact on her- she is feeling her sameness. And thanks to Orion, she is feeling her humanness and her Oneness. No question, I have been recommending Orion’s programming to all. The best part of this program is [Orion and Rick]! It is not too often you find 2 human beings so amazing and gifted. You do not teach theatre, you teach comprehension, you teach teamwork, you teach diversity, you teach confidence, you teach respect, you teach there is no bar too high and you teach what theatre is meant to be, life learning. Both of my children have been blessed by your theatre and you have provided something to them that they will carry through their entire lives, in their jobs and careers, in their friendships and in their learning environments. You have no idea what real impact you have made……..you have made a huge difference in the lives of our children with and without disabilities. You have taught even us as parents, disability is a state of mind not a condition our kids have. 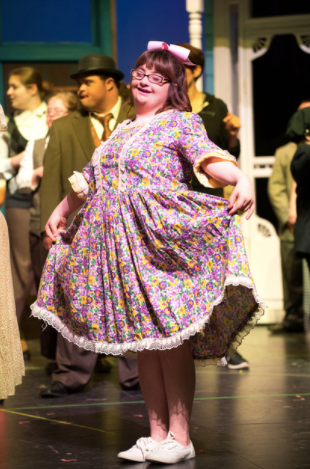 Our daughter, Allison, loves musicals and the songs that accompany them. Her dream was, and still is, to be on stage, especially in the musical Cats. As a parent of a child with many medical problems and Down syndrome as well, we never said “never,” but we didn’t quite picture how this dream could be fulfilled. Then we met Orion, and a miracle occurred. Although Cats has not been performed (yet), Allison has acted in seven musicals. Her dreams are coming true! During that time, Orion has accepted her strengths and difficulties, and, more importantly, made her want to step outside of her comfort zone. What does my daughter get out of this? Just about everything that is important in life. She is challenged socially, academically, physically, and emotionally. She has learned to work hard and work with a team. She has learned the bar is set high, higher each year, and she can accomplish what is expected of her. After the final bow of each performance, every single actor on that stage experiences the thrill of success – their personal success and the success of the group. 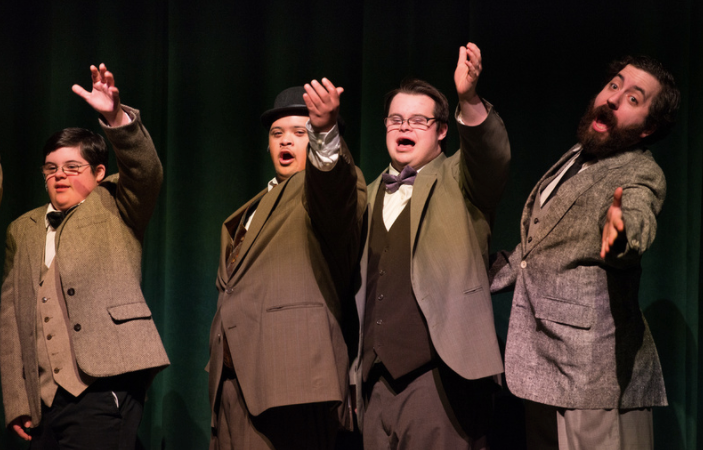 Most of the actors don’t even realize the magnificence of what each performance exemplifies – and that is the true beauty of inclusion – because what the audience sees are the abilities of each actor. In addition to all of this, during the entire process of every production, everyone involved is having fun, and building many fond memories.